How do Farmers Keep Their Ambrosia Apples Fresh? Once upon a time, orchardists kept their apples in a cold cellar and hoped that they didn’t freeze or rot before they could all be eaten, sold or traded. Eventually, the farmers got together and created a cooperative that not only allowed farmers to pool their resources, it also allowed them to store their apples all together. Flash forward to the 21st century and apple storage rooms have gotten a lot more high tech. 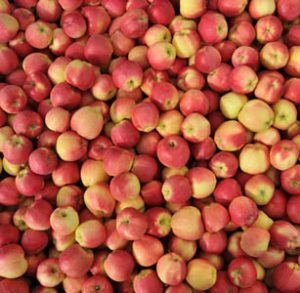 Today, Ambrosia apples are stored in what’s called ‘controlled atmosphere’ storage, or CA storage. It’s not just the temperature that’s controlled, it’s the actual atmoshpheric makeup of the air inside. Oxygen, carbon dioxide and nitrogen levels are all adjusted to levels scientifically proven to slow the aging process of fruit. But, that’s not all. The temperature and the humidity of the space are both carefully monitored and adjusted to ensure it is always optimal for maintaining freshness. You cannot walk into a CA storage room, as it is sealed for the duration of the fruit storage but temperature and moisture are constantly managed. It’s incredibly sensitive! These facilities are two stories tall and the bins are stacked all the way to the ceiling. Speaking of the bins, each one is marked so that the workers know which one is next in line to be shipped to your local grocery store. It may seem like a simple thing but systems like this ensure that all of the Ambrosia apples stay as fresh as possible for as long as possible. All of this impressive technology means that we can enjoy Ambrosia apples well past the day they were picked by one of our local growers. And, they’ll taste just like they did that September day in the orchard. Want to keep them fresh once they leave the CA storage facility? Check out this blog for a few tips on at-home storage.